All three kids went to daycare today, so yes, that was the sound of angels singing you heard around 7am this morning as they all left and I continued to sleep. Apparently writing about my Charlie Bird unleashed a massive flood of worries and anxieties and I slept terribly last night. I woke up around 3am crying. My body was very thankful for the extra hours of sleep and then lazing around I let it do this morning. By 11am, however, being lazy was getting over-rated and I felt the need to be productive. 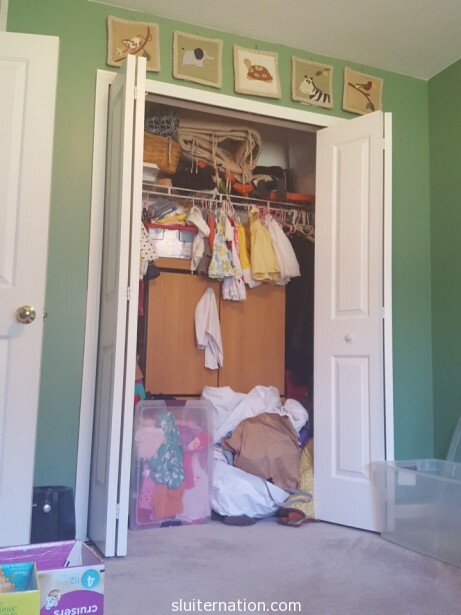 After a glance at my To Do List, I knew what needed to be tackled while all the kids were gone: Alice’s closet. We bought our house in December of 2004, and I moved in right away. Cortney did not join me until after we were married in June 2005, but his stuff started moving in right away. 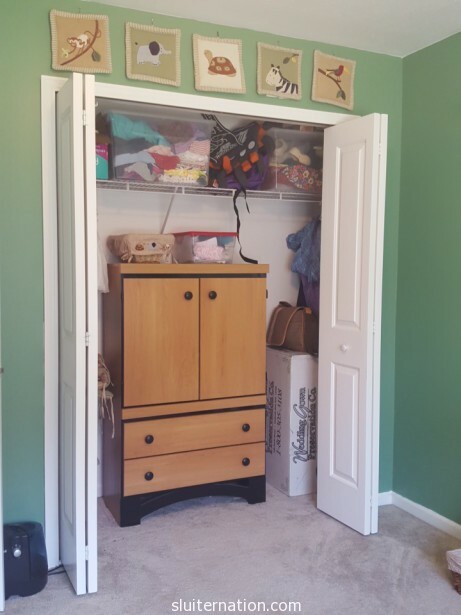 This room was our office/spare room and this closet was the only finished closet space other than our own and the linen closet in the hallway, so it became our first storage spot. As the years wore on, things only got shoved into this closet, not removed. The boys both called this closet sort of theirs when this room became a nursery first to Eddie in 2009 and then to Charlie in 2012. Now it is Alice’s closet. And it’s a total poop show. I tackled that thing in a way I have not cleaned it in all the years we have lived here. And I found things. I found my very first journal That I started in January of 1997–my freshman year in college. In my very first entry, I mentioned needing to write things down because my thoughts jump around and I can’t talk out my thoughts and feelings because when I get to talking about them, I no longer feel them and can’t remember what I thought. I also mentioned that I was writing to calm down because I had some anxiety about going out that night. Huh. I guess some things never change. I also flipped through some of the other entries and was brought back to a lot of angst and “boy problems” and conflict with my parents in my late-teens/early-twenties. So I closed that and set it aside to join the rest of my journals. I found a shoebox full of all the things I had kept on my desk in college including pez dispensers, post cards, hand drawn thank you carts, senior pictures, and silly newspaper cartoons. I found the diaper bag Cortney bought me on Valentine’s Day before Eddie was born. I found all the bottles (aside from the ones Alice is currently using). I found my Dutch Dance Costume (don’t even ask). I found five of the ten bridesmaid dresses I have worn (the other five, along with my old prom dresses, live at my mom’s. MOM, GET RID OF THEM!) and all the dyed shoes that went with them. I found a copy of Ramona the Brave. I found all the cards from our weddings and the bridal showers. I found my wedding dress and the massive slip that went with it. I found my graduation gown from my undergrad ceremony, my Master’s gown, and Cortney’s cap, gown, and tassel. I found two black leather jackets. I found even more than that, but I don’t have the time nor the space to list it all. Most of it got donated, some of it got relocated to a better keepsake spot, a few things got thrown away. I organized three tubs of girls clothes that were donated to Alice: 2T/24 months, 3T, and 4T+. And I stored the few 18 month items I have in her dresser for when she has her next growth spurt. It took me two and a half hours, the Pearl Jam station on Google music, two cups of coffee, a large glass of diet coke, and a granola bar, but I finished it. The only things in here now are Alice’s things, our wedding keepsakes, and a few other things that are not there on a permanent basis. Alice has her own closet space now. I have lots of fodder for writing. And Thursday I plan to tackle the boys’ closet. It doesn’t look like all of that treasure could fit in there! But I know from personal experience that it can. Great job, mama! And good luck today!! Greta Funk recently posted…Five. Already. For Real This Time.